It was bitterly cold. Mind-numbingly so. My air gauge was on empty confirming what my straining lungs already knew. To complicate matters, a quick glance at my dive computer revealed that I was at 104ft looking at seven minutes of much needed decompression before I could safely break the surface. The shark that I had been chasing had long since slipped into the void leaving me feeling curiously vulnerable. I sucked in a final shallow breath from my empty cylinder and considered my options. The surface beckoned seductively but I am experienced enough to know that the short term relief I would feel from kicking upwards and filling my lungs with cool fresh air would soon give way to the onset of tingling, numbness, joint pain and an inevitable trip to the nearest recompression chamber where I would lay in agony waiting for the bubbles in my blood to shrink back into solution. Even paralysis and death might be waiting in that direction. No, surfacing was not an option. I shook the icicles from my mind and wondered wryly how I had ended up in this dark and lonely place. I was on my way to New Brunswick to look for Porbeagle Sharks. Baie Comeau, favourite haunt of the rarely photographed Greenland Shark, lay on route providing me with the opportunity to shoot two illusive species in one trip. I contacted Sylvain Sirois the local shark guide and in no time, here I was descending into the jade green waters of the St Lawrence Estuary. The first shark appeared almost immediately as if it had been waiting for us to jump in. It was soon swarmed by divers and bathed in incandescence from too many dive lights it bolted quickly for the safety of the deep. My chances of getting a good shot amid so much excitement were small so in my shark obsessed fervour I outpaced the other divers and disappeared into the fog. I swam alone for a long time crisscrossing the muddy bay. At 60ft I finally found two massive sharks slowly swimming towards me. 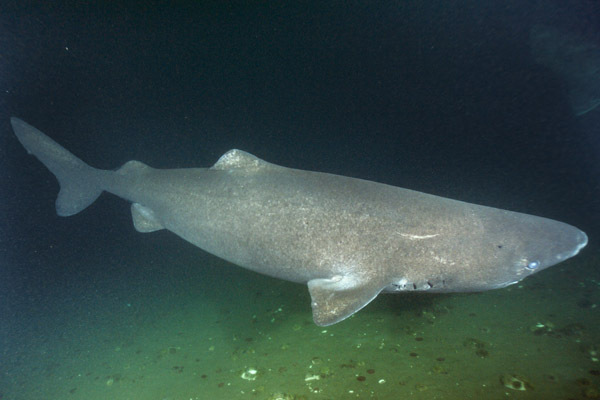 Multiple Greenland Sharks in the same frame would make an admirable addition to my portfolio and I tried desperately to squeeze off an image or two before they separated. Frustratingly, the autofocus on my camera could not pick up enough information in the plankton saturated water and the shutter simply refused to trip. The sharks, both females I think, drifted apart and I followed the lighter of the two into deeper water. In retrospect, it would have been prudent to follow the darker shark up into the shallows but I was looking for a vividly contrasting shot (not safety) and I kicked down after the huge departing tail fin. There is a knack to chasing sharks. All out pursuit with rapid and explosive fin kicks is unlikely to have the desired result. Invariably the shark will speed up keeping it tantalizingly out of reach. The key is to adopt a powerful yet leisurely kicking style while maintaining an almost meditative breathing pattern. Although the shark may pick up on your secretly pounding heart, you will have a way better chance of falling into step beside it if you take slow shallow breaths. By the time I had achieved this uncomfortable state we were much deeper than my computer was happy with at this late stage of the dive. At 100ft I could no longer deny my starving muscles. I composed one final shot during which the shark turned and almost knocked the camera from my freezing hands, and then I began gulping in enormous breaths. Now I was kicking much harder to keep pace with the agitated shark. As a result of all the heavy breathing, my air supply had dwindled to around 700psi and I knew that I needed to head back really soon. The shark was outpacing me with each subtle flick of its caudal fin. Rather than break off pursuit, I tried to increase my gait even further and then the unthinkable happened. Without warning my regulator froze open and started to free flow. Air belched out from my second stage uncontrollably. With bulging cheeks and lungs at full expansion I spat out the mouth piece and watched in horror as the precious gas shot skyward in a violent stream of bubbles. In no time at all it slowed to a trickle and then stopped, leaving me with no air at all. Fortunately, I don’t have much of a panic reflex. Once while mountaineering, I lost my footing and tumbled 300ft down an ice slope. I was exquisitely aware that below me lay 2000ft of vertical headwalls and jagged outcrops of rock. Survival was unlikely but even after I lost contact with the cliff I continued to flail towards it with my axes in the hope of somehow slowing my descent. There was no question of my giving in to panic. While conscious, I would fight for survival. That journey ended in a spine crushing stop on a very narrow ice shelf. The one that I faced today would be much slower and would require all the self discipline I could muster. I knew that if the rest of the divers were still in the water they had to be somewhere behind me along the slope. Staying calm, I turned in that direction and settled into a loping frog kick stroke that carried me slowly upward. Surely the group would still be floating around close to Sylvain’s dive boat. And, there was a second group that may have descended by now and could be heading in my direction. The blanket of emerald fog ahead of me remained completely featureless; devoid of divers with their precious cargo of air tanks. What if they had all swum the other way inadvertently increasing the space between us? I put that thought aside and continued to kick. Twenty seconds into the diagonal ascent the expanding air in my lungs began to hurt a little. Reluctantly, I breathed out enough to equalize the pressure and tried not to think about breathing in. CO2 build up was becoming a problem. Carbon dioxide returning to the lungs is what makes the body want to take its next breath (not the lack of oxygen). It took all my will power to stifle the increasing urge to breathe. I tried to concentrate on my kick cycles and continued to look desperately for divers in the mist. Onward and upward, 50ft, 45ft, 40ft. Where were they? My lungs were screaming! What felt like an hour but was probably less than a minute passed in an agony of diminishing self control. Combined with the need to breathe I was beginning to feel an increasing lethargy and dizziness. In the back of my mind I knew that my plans would soon have to change. Decompression sickness or not, the surface held endless amounts of air. If I did not head up soon I might lose consciousness underwater and simply sink to the bottom before I could make it all the way up. I needed to see divers within the next few seconds or it would be too late. When I hit 30ft the fog began to open up a little and far ahead of me I finally spotted the second group descending on their dive. They were so distant that I had no idea if I would reach them in my oxygen deprived state. I could feel my hands beginning to flap aimlessly while the nerves in my stomach twisted my intestines into knots. 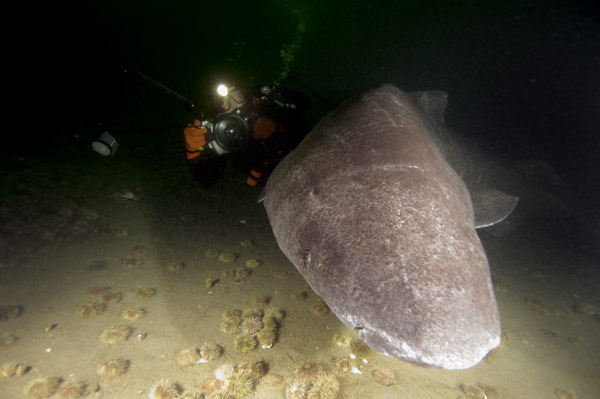 These feelings continued for two or three seconds and then off to my left I caught a glimpse of my friend and fellow shark photographer Maris Kazmers kicking after a Greenland Shark. Kaz was even further away than the group but I had a momentary urge to kick over to him and snap a couple of shots of his shark before lapsing into mindlessness. Ignoring that irrational idea I closed to within twenty feet of the other divers and started squeaking into my empty regulator to get their attention. One of them looked up briefly but not in my direction so with a final all or nothing burst of speed I lunged towards the nearest person and plucked their alternate regulator from their BCD. That first long deep breath of oxygen rich air was incredible. I sprayed spent air outwards and greedily sucked more into my aching lungs. The inexperienced donor, feeling the unusual tug from behind rolled around and immediately pulled the regulator from my grasp. I was expecting this reaction and let it fall away. Turning towards a second diver I gave the signal for wanting to share his air. I waited patiently until he offered me a regulator then I motioned for the three of us to ascend towards the anchor line where I hoped to find Sylvain. Sure enough he was waiting in the shallows and I thanked the two divers that had given me air and swam towards Sylvain with a big grin on my empty mouth. There was a brief confused look on his face followed by a mad scramble to find and donate his alternate air source. I waited bemused now, resigned to the idea of being helped out of the water, aware that I would have some sheepish explaining to do. So be it. Sylvain waited patiently with me while I completed my deco stop and then the two of us ascended and climbed back aboard his boat. Much laughter followed but I learned a valuable lesson that day. Sharks are definitely not the most dangerous aspect of shark diving. Neither is extreme cold or poorly maintained equipment. The most dangerous thing that a shark diver must contend with is shark fever. Mountaineers call it summit fever. Wreck divers that risk all to bring back a broken plate from notoriously dangerous wrecks call it china fever. Call it what you want but beware of the madness that drives men beyond self preservation in the pursuit of their passion. 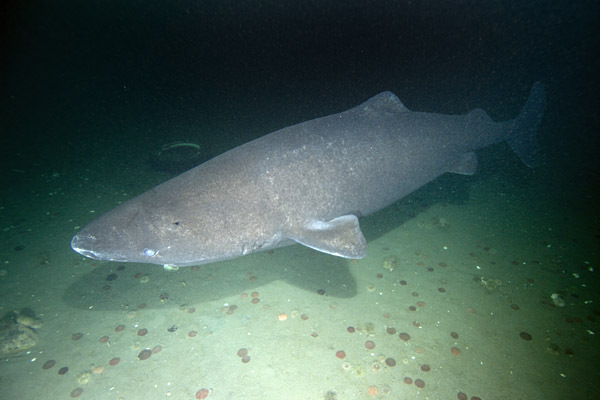 For further information on the Greenland Shark including a species i.d. 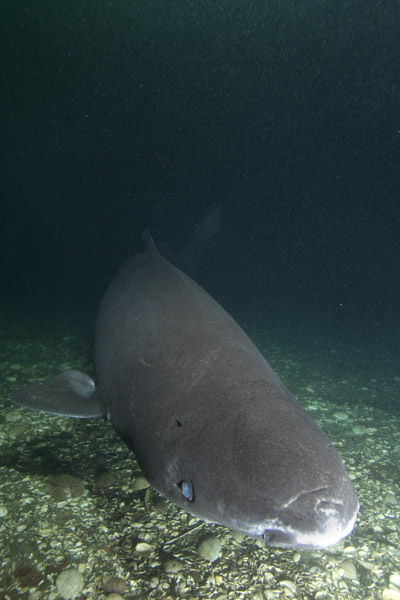 guide, distribution, behavior and info on diving with Greenland Sharks in the wild please visit the Greenland Shark Information Page.